Other destinations include Harrisburg, PA (13 miles), Lancaster, PA (39 miles), State College, PA (64 miles), Penn State (64 miles), Baltimore, MD (61 miles), Washington DC (85 miles) and Philadelphia, PA (101 miles). 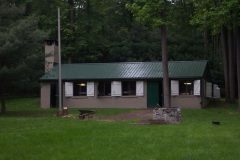 Facilities include a heated cabin with 14 bunk beds to sleep 28 people, commercial 6-burner electric stove/oven, refrigerator/freezer, sink with hot and cold running water, enough tables and chairs for the occupants and a wood stove supplemented by a propane heater. 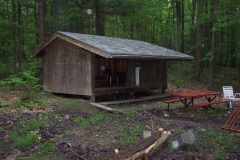 In addition, an Adirondack shelter provides shelter for 10 to 15 people. 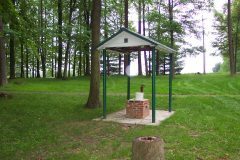 Other features include a 25 ft by 50 ft pavilion with picnic tables and electricity, a latrine and more. 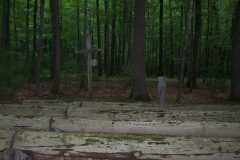 The camp's 14 acres is mostly wooded, but there is also plenty of cleared area for tent camping as well. 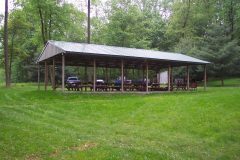 If interested in using Camp Pioneer facilities, please contact Campmaster, Tom Fogarty, at 717.773.9585 or e-mail at campmaster@bsatroop196.org to reserve your event dates. Directions: Take Route 15 South to Dillsburg. Just past the "84 Lumber Company", take a right on South Mountain Road. Proceed on this road for 4.4 miles. You will pass a church on the left and must then bear right onto Coffeetown Road. Travel 1 mile. You will proceed two driveways beyond the Dillsburg Fish and Game Club and turn right onto a gravel lane marked by red posts. 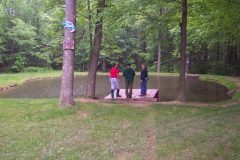 The gateway to Camp Pioneer will be just around the bend. If you reach Whiskey Spring Road, you have missed the gravel lane and have gone too far.